Home / Without Label / Important Benefits of Spaying and Neutering Your Dog. Each of these procedures is the type of surgical sterilization that is performed on dogs, cats, and other animals. Spaying refers to the surgical sterilization for a female dog, and neutering refers to sterilization for a male dog. If you have a female dog, you will want to ensure that your dog is spayed before her first heat period, because the procedure is most successful when it is carried out before your dog is sexually mature. In dogs, this can be anywhere from 2-6 months of age. How the neutered or spayed process is conducted is by through a small surgery. Dogs are under anesthesia and this process will need a couple of hours or a day depending on the age, the size, and the health of your dog. Neutering is a surgical procedure to remove the testicles, while Spaying is also a surgery process to remove the whole reproductive tract. (Fallopian tube, uterus, and ovaries) Neutering will be a simpler surgery in compares to spaying. Whether your dog is male or female, there are many benefits that you will certainly enjoy, if you have him or her "fixed.” You will not have to worry about your dog having a litter of unwanted puppies, which could, unfortunately, lead to abandonment, euthanasia. You also will not have to worry about the behavioral problems that occur naturally in dogs that are not neutered or spayed. Other benefits are more specific to either male or female dog - spaying or neutering. Within a six year period, a single unaltered female dog and her offspring can give birth to more than 6000 puppies. 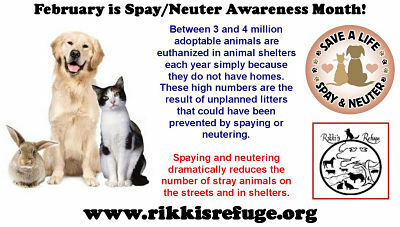 Therefore, the act of spaying is carried out to control the high levels of euthanasia because of overpopulation. Neutering and spaying also reduce urine marking and make a dog less likely to roam about or run away. Why is it essential to spay or neuter your dog? According to the Humane Society, about 6-8 million homeless animals enter animal shelters each year. About half of these animals are adopted, and unfortunately, the other half is euthanized. Yes, you have read that correct: 3-4 million dogs are killed every year. Many of these animals are healthy, sweet pets that would otherwise make great companions. While the most are mixed breed an amazing 30% of the homeless dogs are purebreds. These terrible figures are what drive animal advocates to continuously encourage the general population to have their dogs spayed or neutered. Most animals find their way into shelters for a variety of reasons. But millions of dogs each year are taken to shelters because they have been abandoned or because their owners are no longer able to take care of them. By Spaying or neutering your dog, you can do your part to avert this tragedy from happening. A neutered dog and spayed dog has a longer life span as dog spayed has a longer lifespan because they are in good health and happier. A neutered dog will not be susceptible to the testicle cancer correspondingly spayed female dog will not be vulnerable to ovarian cancer. Therefore reduce the risk of getting breast cancer. In addition, neutered dog and spayed dog urine are not as strong in odor as non-spayed or non-neutered dog. Neutered and spayed dog live happier than non-neutered and non-spayed dogs. This is because, like a human, dog’s emotion is affected by the hormones in their body. Neutered or spayed dogs can live happier as their hormones levels are being controlled and no mood swing occurred! Important Benefits of Spaying and Neutering Your Dog.